As I start preparing my income tax documents for last year, I have been struggling to come to terms with how I managed to waste so much money. Not only did I manage to spend a lot of money, I also have very little to show for it. One major expense was a vacation I took last year, but that doesn’t come close to accounting for all the wasted money. A bigger expense that I need to accept is dining out and take out food. First and foremost, I love good, healthy, and sometimes not-so healthy food. I really enjoy trying new restaurants and indulging in my favorites from my local hot spots. I think my tastebuds must be wired directly to the part of my brain that tells me how happy I am. I’m not particularly picky either. I love it all…fast food, sushi, chinese, korean, vietnamese, italian, greek, etc. My mouth is watering just listing this stuff! Then the other half of my excuse is just plain laziness. After working all day and trying to fit website/blogging work into my free time, I just don’t want to spend a bunch of time cooking and cleaning up after it. Home cooked food can be just as tasty, but how do you fit in all that time every day? Another excuse I like to tell myself is that at a restaurant it is sometimes barely more expensive than making the same meal at home. While that may actually be true with certain foods, most of it is much, much more money when you are paying someone to cook for you. If you’re going out to a restaurant, think of all the people that they have to pay on top of the price of the actual food. Then add in the high price they pay for their location and all the other random expenses that they incur. After all is said and done, they are still making a hefty profit. Yes many make more money from drinks, but they still profit on the food. If you think delivery food is any better on your wallet, keep in mind that you are paying someone to drive that meal to your house. Plus they are still paying their kitchen staff and miscellaneous things such as marketing. 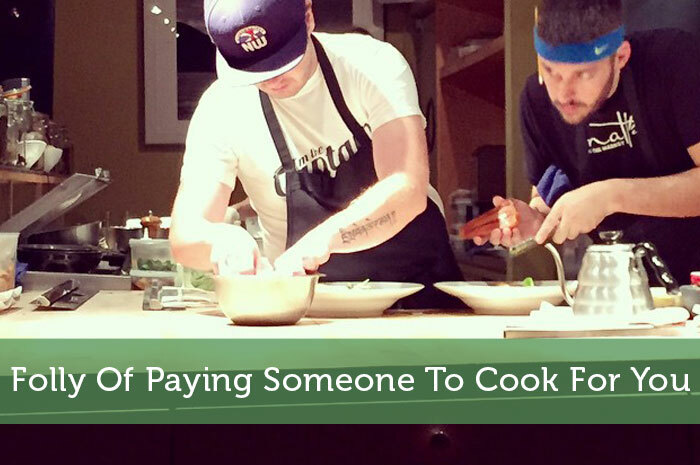 Back in the day, only the very wealthy would even consider paying someone to cook for them each week. Now there are so many restaurants everywhere that people feel entitled to it at least once per week. As much as my bank account wants me to quit cold turkey, I am just not that strong. With the temptation everywhere, I just can’t find the will to resist. Besides, there is nothing wrong with treating yourself sometimes. It just needs to be done in moderation. First, I am gradually moving away from the more expensive restaurants. I used to live downtown where you couldn’t walk around the block without passing by 3 or 4 top notch restaurants with chefs that cook divine food. That was very pricey. Next I moved to the suburbs and I was suddenly dining out far less. Unfortunately I balanced that out with take out or delivery food. If they weren’t going to cook right next door to me, I was going to make them come to me. Still I was gradually starting to cook more and spend less. Eventually I want to move somewhere with even fewer dining out and delivery options. Since I grew up in a small town with very few dining choices, we cooked almost all of our meals. I need to transition back into that habit. Besides moving to avoid the lure, I’ve also been trying to limit how many times I dine out each week. Really though, I should be getting more strict and keeping track of it all in a budget. I’m not sure if my procrastinating skills are at fault or if my stomach isn’t letting me take that step. At least I’m not in denial anymore. That is one of the first steps of dealing with addiction, isn’t it? It might take years to stop this addiction , but baby steps are better than nothing. So what about my readers? Do any of you have weak willpower when it comes to food, especially your personal favorites? Or do you have some good strategies to ensure you cook at home more often? I looooove food! When I was in college and even a couple of years after, all I did was eat out. It really took a big toll on my finances and I’ve learned that a big part of saving money is by doing it yourself. My wife and I love to cook and we create a weekly menu that helps us stay organized. It’s tough to come home, figure out what to cook, and hope you have the food at home to do it. By learning to get a little more organized it’s really helped us do everything at home. You should check out some of my recipes and give them a try! Haha I guessed that much Jason with all the great recipes on your blog. That’s a good point about meal planning. If I have all the stuff at home I’m a lot more likely to cook than if I have to run to the store to pick up some ingredients. I’ll have to browse through your recipes some more. Is there one you would recommend? I currently work from home selling export goods, sadly I don’t know how to cook either but I really love food. Going out to eat is nice but for some reason when I have to pay for it , it doesn’t taste so good anymore. I’m not sure why. Anyway, ever thought of getting a gf/wife who can cook great? My last girlfriend was an awesome cook. It’s just too bad that we had some personal differences that made it not work out. It is nice when at least one person in a couple has some cooking skills. Thanks for sharing those recipes Jason. I think I could manage those. I’m a better cook than I give myself credit for. Maybe I got in the habit of putting down my cooking skills so that my exgirlfriend would spoil me with her cooking. Usually my problem is more about coming up with something each night that still keeps things interesting. I love Work Save Live’s recipes! Not saying I use them a lot… most of the time I’m too lazy. What has really helped me in spending less eating more is being mindful of the calories – it’s pretty hard to go out every night unless I want to double my size. I can’t be bothered to count calories, but I do acknowledge that restaurant food is generally less healthy. My reasoning is more based on the money and time involved. We find meal planning a huge help. Every two weeks we sit down and meal plan for the next two weeks and we make our grocery list accordingly. It saves a ton of time during the week when we come home hungry and tired. We just make the recipe we decided on and boom, we are done. Picking meals that take no more than 30 minutes to prepare is also essential. Good tips. I do find that the whole decision part can be tough. By doing meal planning you can also take into account which grocery items will have leftovers. Plus you can more easily factor in the price of each meal. Then it’s not about what you think you might be craving that day, because really I’d be happy with any of my regular meals on any given night. There are companies you can pay to do your meal planning for you. It will probably still be cheaper than eating out, not only your wallet but also on your health. I think I’m too cheap to pay a company to plan my meals. To me that kinda defeats the purpose of cooking more often to save money. What helps us a lot is batch cooking. We like to make a big quiche or a big batch of breakfast burritos which will last for a week or more. The hardest meal for us is breakfast since we usually wake up, get ready and fly out the door. Breakfast is no problem for me since I love cereal. I’d be happy eating that every single morning for years. I do some batch cooking but probably not enough. I find there are only certain meals that I would bother making more than enough…things like spaghetti, lasagna, stew, etc. That strategy does make for some great leftovers. I just need to find more meals that are just as good the next day. The trick I’ve been using to wean myself off delivery food is gourmet frozen ready meals. They’re little enough like cooking (pop them in the oven! wait 30min!) that they feel like someone else preparing food for me, but also tend to be less than half the price of takeout for two (£5-8/two-person dish vs around £18-25 for two peoples’ worth of takeout). I don’t have them for dinner very often but I do try to keep lots around for those nights when I just don’t feel like cooking. They hit that “ooh! nice food someone else has made for me!” button in my brain. I’ll have to give that a try. I’ve done the cheap microwave meals for lunches, but they usually didn’t fill me up and they didn’t always taste very good. I guess if I buy the fancier ones it might solve that problem. My crockpot is one of the only things that keeps me from eating out all the time (and I do LOVE to eat). I don’t have a lot of time to for meal prep, so I toss everything in the crock pot and let it go. An added bonus is the bf has a hot meal when he comes home. Since I work 2-10 and don’t get home until 11 most nights, I like it that he can still have a “decent” meal when I’m not there. Eric is a lucky man. Even when you’re busy working, he still gets some good home cooking. I think most wives in that situation would just let the husband fend for himself. I should give another try using my slow cooker. I’ve only used it a couple times, but never had any favorite recipes that I would use it for. Jeremy, one of the things that has worked well for me is to do a half-and-half arrangement, coupled with leftovers. I’d prepare the main dish myself (usually some sort of meat dish) and then I’d get a side order of something from takeout (like the chinese green beans in a tasty sauce). The stuff I prepare (which usually included a side dish as well, coupled with a single takeout item, all of which lasted a couple days, helps spare the wallet and it helps hit the craving for the take-out flavor. Because honestly, no matter how hard I try, I can’t make some things as well as someone who’s done it 10,000 times. That’s an interesting idea which might be a good compromise. I’d probably switch it around and make the sides myself and order the main dish. Still it would be a good way to limit the amount of cooking/cleaning required and get to satisfy my take out cravings. Thanks Karl. I’m sorry, but I LOVE food! If there is one thing I will splurge on, it’s a nice meal. Take back the car, cancel the cell phone, cut the Cable, but don’t take my food! Haha I hear you. I’d probably be fairly happy with food as my main luxury too, but it gets expensive. I think I need to at least balance it out with cheaper meals some nights. We never go out to eat. I want to save money, but also I want to be healthy (and it doesn’t hurt that Jeff and I are both trying to get in shape! )I like knowing exactly what I’m putting in my body, so that helps motivate me to cook at home, too. The biggest pain that I can find with cooking at home is cleaning up afterwards. See, unlike you, I don’t want someone to cook for me….just come over and do the dishes? Please? Healthiness is a good factor to mention. Part of the reason that food from restaurants is so tasty is because it is loaded with sugars and salt. Me and my ex had a good system with cleaning and cooking. She did most of the cooking and I did most of the cleaning. Unfortunately it usually didn’t balance out, but at least we didn’t have to eat my half-assed cooking. Jeremy – I’m just as prone to gluttony as the next fella. It’s tough when there is so much good, crappy food out there! Recently though my wife and I have begun eating better and while it was (still is) a struggle – there are loads of benefits in it. Now if I can just stay away from those donuts! Haha, so you have a sweet tooth too Aaron? I have to use some serious willpower to avoid buying sweets or else I’ll just devour it asap. If you’re struggling with the switch, maybe it would be a good idea to fit in the occasional unhealthy meal. Or try switching up your weekly meals more to keep it interesting. Maybe even have a night where you experiment with a new recipe. Eating out is my #1 favorite way to spend money – even more than clothes. My parents were also heavy “eaters out” as I was growing up, so I learned to love food from them. My husband and I, however had to cut that out when we pared down our budget after having kids. Trust me, it’ll be the first thing to return to our budget when our finances rebound! It’s gotta be up there on the list for me too. I can’t say I got the habit from my parents since they’ve always been fine eating at home. My last long term girlfriend grew up working in the restaurant industry though. So her family was always going to different restaurants with the excuse of checking out the competition. Really though, they just love good food. I think that must’ve rubbed off on me too. I have decent willpower, but nothing to brag about. I definitely waste a lot of money on food, but I do so within a pretty flexible but aggressive budget. Basically, I auto-invest enough to make sure I’m going to retire well and/or early, so if I waste a bit on food, I know I’m still on track. QUERY: Possible to get enough people together to hire a personal chef to do shopping and mass cook and pay less than groceries + lazy restaurant splurges? It might be tough to manage (dietary restrictions, tastes, etc. ), but if you could work that out, it could be a really fun concept. Too 1%? I guess I need to increase my income so that I have more flexibility for this obsession. Regarding the personal chef thing…I’ve read that there is actually a thriving underground restaurant scene here. Basically a chef runs it out of his or her home and a group of friends would book him for the night. Then they’d all go over to the chef’s home to have a great meal cooked for them. I doubt it would cheaper than a regular restaurant though. Done with a chef just out of culinary school it might be a better deal. I too trick myself into believing that eating out isn’t *that* much more expensive compared to cooking! The vice that plagues me the most is eating out for lunch. I actually really enjoy the company of my co-workers and appreciate getting out and about for 45min-1h instead of staying cooped up inside. That makes it tough to want to bring in left-overs from the night before. Getting better at it slowly though, I’ve limited myself to eating out for lunch 2x a week, 3 max. The rest I cook and bring from home. That part makes it tough, when it is also part of your social life. You’ll just need to convince some of them to bring their own lunches sometimes and bring the party to the office lunchroom or a nearby park. With some meals the price at a restaurant versus making at home is actually fairly close. Something like sushi I would probably never make at home due to the cost and the ingredients required. On the other hand, something like pasta or chicken, I rarely buy that in a restaurant because I can make it at home for cheap. With all the great restaurants in the Vancouver area it is no wonder that you dine out a lot. I probably would too. We use to dine out just because we didn’t feel like making something. But now with meal planning and watching our budget I have come to the conclusion that we will only dine it for meals that we cannot make at home, such as chinese food. And like Kari mentioned, crockpot cooking is the way to go if you don’t want to spend too much time in the kitchen. You will have leftovers for days! Grab the free crockpot recipe book from my site if you like. Thanks. I will have to grab that crockpot cookbook. Perhaps you have some favorites you’d recommend. The great restaurant choices definitely does play into it. When the food dining out is quite good, you are even more tempted to take advantage of it. Based on all these comments so far, it really sounds like I need to get on the meal planning bandwagon. For some reason I had always been prejudiced against the idea thinking that it would lead to monotony such as Taco Tuesday every week. As I think about it more, it makes a lot of sense. I can’t say I grew up with Taco Tuesday or anything. I have heard of families that have the same meals each week which seems to boring to me. Eating out is definitely a drain on my budget. I love eating out and so does my girlfriend. What I have done to try to help is cut back and/or out of just getting a quick meal for lunch or so. This allows me spend money on nicer dinners with her. Lunches are an easy enough spot to save money on dining out, but for me it was the dinners that got expensive. When those nice dinners are a few times per week, that eats a big hole in your budget. Once you get used to a certain lifestyle, it can be tough to cut back. I stopped eating grain, which will pretty much make any restaurant menu worthless. I haven’t eaten out in about two months! Congrats John. I hope that was just a healthy living decision and not some kind of gluten intolerance. Restaurants are my weakness. I love eating out, and trying new foods. I like the comment from Miss T about meal planning. I will have to try doing that. I am trying to eat out less, but try and save by finding places that offer Happy Hour. Its a great way to save 50%! Yes there are ways to save money and still dine out occasionally. Happy hour is one option. Also you can often find restaurant coupons to bring the price down even further. I’m a high school student in the exotic country of Singapore taking a personal finance course. One of the interesting projects we’re conducting right now is our expenses project, where we list all the things we spend our money on. I’ve been keeping good records of my spending habits, and the most surprising expense is that of food at restaurants. Of course, I love food, especially expensive high-quality foods, so trying to limit these expenses has been difficult. I’ve been slowly weaning myself off this habit though. When I pass by a McDonald’s or some sort of other fast food place, I get tempted to buy something. But I take a look at the price, and even though a thing like a McFlurry only costs $2, those small expenses can quickly add up. Now, I’m more inclined to walk away and maintain my frugality. Since I still live with my family, I’ve been lucky enough to have a mom who cooks good and healthy food for me. Eating at home instead of at a restaurant, as you said in your blog, can save a lot of money. I’m leaving for college soon, though, and I’ve promised myself that I’ll limit how much I spend in restaurants and try to cook meals in my dorm room. I think the way you limit your spending is well-thought out! It’s not enough to trust ourselves to not spend a lot of money, so your idea of moving away from expensive restaurants to remove that temptation was a great idea. You make me miss having my mom cook meals for me. It was nice not having to worry about that responsibility. I think when you move out for the first time it is the toughest time to avoid dining out and delivery food. Most people at that age just don’t know how to cook very well. So it’s so much more satisfying to order some good food cooked by someone else. I love eating out too, but I’d rather go to restaurants with really good food. We usually don’t eat out for convenience sake. Maybe you can take a few cooking classes and learn how to make really good food at home. This way you won’t be tempted to eat out so much. The really good food was part of the temptation that made it tough to give up. I say I’m not picky, but I’d be spending the extra to go the better sushi joint, the better Thai place, etc. Cooking lessons are an intriguing option, but spending money to save money is difficult, especially when it involves a big time commitment. I do make some really good dishes, but I rarely get adventurous enough to expand my repertoire. Well, obviously I’m guilty of this–but I have a very strict food budget ($10.00 a week). This bottlenecks my desires a bit, but I have found that things like groupon can really help stretch the budget. $10 a week is a nice reasonable budget. And yeah, getting off at 5 would definitely help with finding time to cook. It’s usually more of a problem when you get home and don’t have time to relax a bit before starting to cook. I think the biggest thing is allowing ourselves more indulgences in the grocery budget to make up for it. We really love food, too, and I actually crunched the numbers awhile ago – even eating out at fast food outlets is far more expensive ! I think I include too many indulgences in my grocery shopping. It seems I always convince myself to get something that is either unnecessary or a little pricey. Cravings can sometimes get the best of me. I really love food but love money and saving a lot more. I think many people think the time they save and the fact the believe it costs about the same is a good reason. Another thing is because so many others do it they just assume its ok for them too as well. Good point about the entitlement side of it. If you’re seeing photos of your facebook friends going to nice restaurants, it is natural to feel that you deserve that too. The time factor does become more pronounced for people who run a business from home. For some of those people it might make more sense to skip cooking sometimes. They might be able to make up for it in the extra time they have to spend on their business. We live out in the sticks where the nearest decent restaurant is 30 minutes away, so we only go out about once a month. I REALLY enjoy it when we go out, and I savor every single bite. Your post made me really hungry! The title of your recent blog post is making me hungry! I love peanut sauce on chicken. You would enjoy meals out more if it wasn’t such a frequent event. Where you live does play a big role in how often you justify going out for meals. I love restaurant food. We eat (usually takeout) at a decent (non fast food) restaurant at least once a week, and then I get lunch out, like pizza, wraps, etc, at work at least 3x a week. It adds up and gets to be extremely expensive. The only cheap thing was $1 pizza slice day. They took it away recently, but I honestly couldn’t have made lunch cheaper. Takeout dinner once a week isn’t too bad. Still, it does add up combined with the lunches. I think the trick to cheap lunches is making extra dinner the night before so that you have leftovers. When I consider the “time it would take for me to cook” factor, I try to remember that it’s going to take someone else time to cook that food, too….I’m just paying for it not to be me! That’s been helping us get our food budget under control. It all depends on what you do with that saved time. If it just goes to sitting in front of the tv or relaxing, it’s probably not worthwhile to pay someone to cook for you. If you instead put that time towards a side business or other important responsibilities, it becomes a better idea. Try this. Remember the amount your last restaurant bill. Go into a supermarket or premium meat store. Spend half of the amount of your restaurant tab on a nice steak. Broil the steak on a barbecue or top oven rack. It’s easy. Eat well and save money. I used to do that, but having steak every week felt counterproductive. So now I stick to mostly cheaper meats like chicken drumsticks, pork, ground beef, etc. Personally I appreciate a good desert more than a good steak. Changing your spending habits is a nice way to save money. I would suggest to set an upper limit for your eating outside in initial stages and gradually decrease it. I too have many extra spending. The first thing I need to do is to track my expenditure. That’s part of my problem…I don’t properly track my expenses yet. That makes it a little more difficult to gradually decrease my dining out and takeout spending. Instead of going by dollar value, I tend to instead try to limit myself in the number of times I eat out. I must admit I’m a takeaway fan, and I love dining out. Maybe because somehow when food is cooked by someone else it always seems to taste better, or just because it saves the effort of cooking. But the price for that ‘luxury’ can be an additional few inches on the waistline, and a hole in the wallet. Well since most of us aren’t professional chefs, I guess the food actually does taste better when someone else is cooking it. They’ve had the time to perfect all their recipes with just the right amount of excessive sugar and salt. That tasty food does have its drawbacks though.